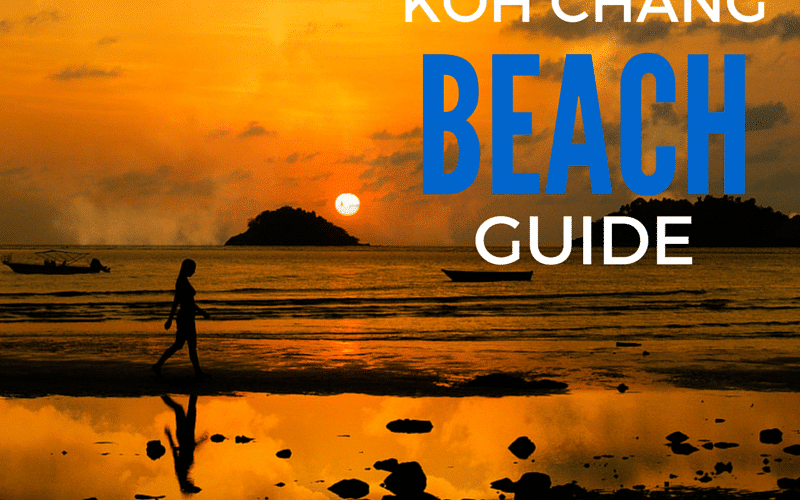 What is the Best Beach on Koh Chang? 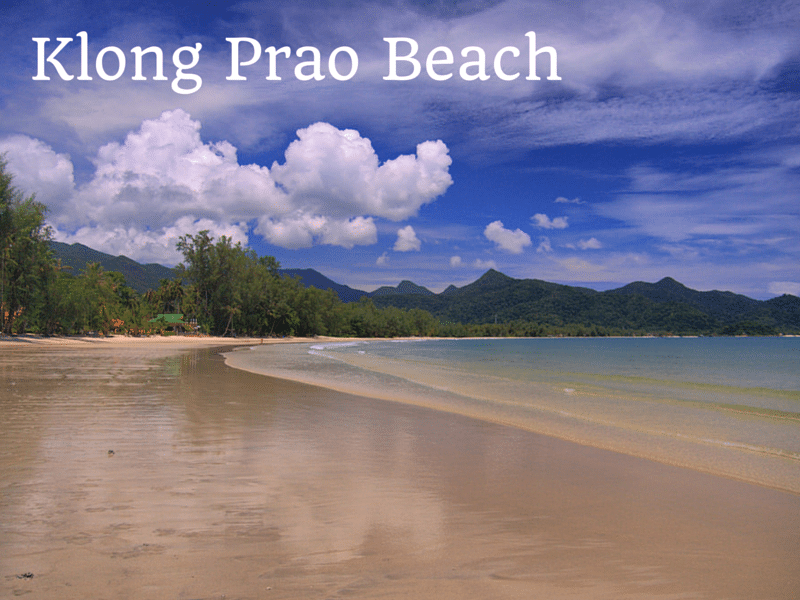 Koh Chang does have a multitude of amazing beaches and are one of the island’s most prominent features. The most popular beaches are White Sand Beach, Klong Prao, Kai Bae and Lonely Beach, but with being some of the most established, also means they are usually very busy, especially in the high season. If crowds aren’t your thing don’t panic, there are more remote beaches further down the west coast, right down to Bang Bao bay on the south of the island, and even further afield. If you’re feeling adventurous head across the island and find your own piece of unexplored paradise along the remote east coast. Starting off originally as a small village with a few basic bamboo huts as accommodation, White Sand Beach is now the main hub of tourism on Koh Chang. With its 3 km stretch of soft white sand and its backdrop of jungle clad mountains, you can see why White Sand Beach has been developed extensively, maybe too much some may say. If an active nightlife and a beach holiday with comfortable resorts are what you’re looking for, then this is the place for you. But White Sand Beach isn’t for everyone if you’re looking for a relaxing getaway, away from the crowds and to escape everyday life don’t come here. The northern end of the beach is where the chilled out backpackers village is located, staying here is an option to escape the main tourist drag of White Sand but still be close to all the amenities. Thankfully while White Sand Beach has been over developed, rules governed by Koh Chang’s national park status has meant no buildings are allowed to be built over 4 storeys high. 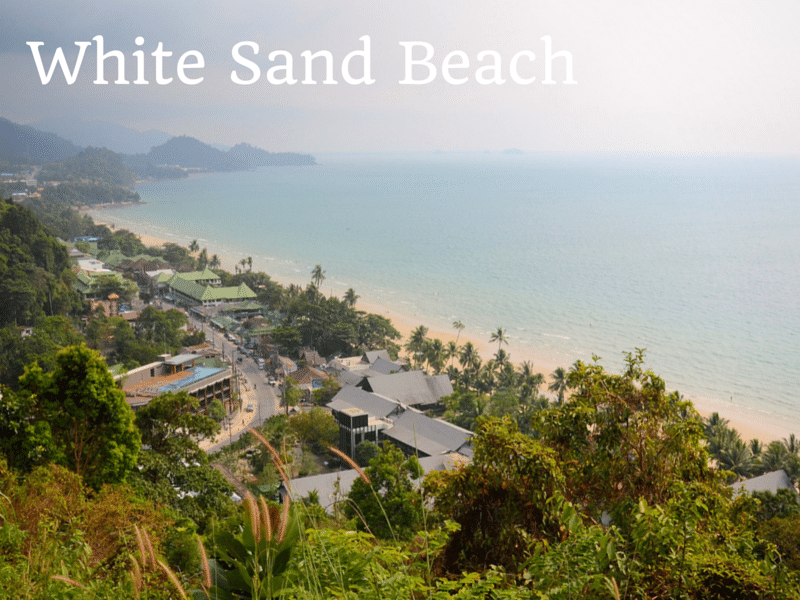 This allows White Sand to retain some of its charm and scenic views. There are of course advantages to staying in Koh Chang’s most developed spot, you’ll have numerous restaurants to choose from, all offering up a range of local and international cuisines. Along with a wide choice of bars, to small beach hut bars and even a nightclub, the nighttime entertainment is very active. All the amenities found here are what you expect in a developed tourist area, banks, minimarts, travel agents, gift shops, tailors, pharmacies, plus more are all available if needed during your stay. The area of White Sand Beach can predominately be split into two, north and south. The southern and central areas are mainly dominated by midrange and upscale resorts. The central area is where one of the best portions of the beach is found, along with crowds of holiday makers and locals wandering the beaches plying their trade. If you’re looking for comfort and can handle crowds, this area is a good choice for the classic beach holiday. Moving to the far south of White Sand, the beach disappears making way for cliffs and rocky outcrops. Atop the cliffs, looking out across the sea are a few of the quieter resorts and better quality restaurants. This is also where you will find the International Clinic along the main road, with a selection of other amenities including a bank. The totally opposite end, in the far north of White Sand Beach, is the world apart from the central and southern areas. Here you will find a less developed part of White Sand, with cheaper accommodation suiting the budget and longterm traveller. There is a more laid back vibe here with fewer crowds, in a more natural setting. Located centrally along the west coast of Koh Chang, Klong Prao is home to some of the most high-end resorts on the island. While there are budget and midrange accommodation choices available, the top end resorts are the main draw to visitors of Klong Prao. 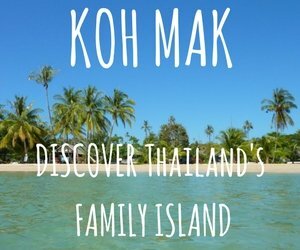 Some of Koh Chang’s best stresthces of beach are found here, the long expanse of fine white sand and calm, clear waters, palm trees running along the beach edge and picturesque scenery makes this the ideal location for people wanting to escape the most touristy areas on the island. The beach is split into two via an estuary that runs out into the sea through a coconut plantation. Actual Klong Prao is the village extending inland from the sea, but the name is used to cover the five kilometres of coastline from Chai Chet in the north to Kai Bae in the south. Due to many of the resorts stretched out along the Klong Prao coastline, there isn’t really a central tourist hub to speak of, unlike White Sand and Lonely Beach where there is. But because of this the area is not overrun by crowds and not as highly developed as other places, this brings a more relaxed feel around the area which is perfect for couples and families. Towards the village of Klong Prao, a riverside road leads up to Klong Plu waterfall, the most popular waterfall on the island is worth a visit for the scenery and, of course, to cool down by taking a plunge into the natural pool, just head there early to avoid the crowds if that isn’t your thing. 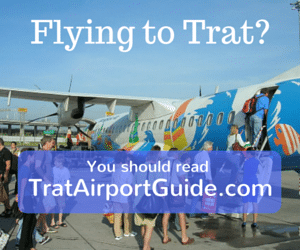 The village of Klong Prao can be reached via a few minutes walk from the beach heading inland, you will come across a couple minimarts, a bank, tailor shops, travel agents, plus quite a few bars and restaurants. The centre of the village is home to Klong Prao Temple, where fairs and festivals are held. A good dental surgery can also be found at the southern end of the village, and there’s night market just north of the temple. Plus all manner of ‘normal’ shops. A range of budget and mid-range accommodation can be located spread out through the village and surrounding areas. There are also four elephant camps situated in the Klong Prao area, and occasionally you’ll catch a glimpse of one trudging along the roadside or heading off into the jungle interior. Other noteworthy places which can be found here are the Blue Lagoon and Kati Thai cooking schools. Kai Bae village and beach are located just past the far southern section of Klong Prao, just before the main road rises over the jungle-clad mountain connecting the south-west of the island to the rest of the west coast. 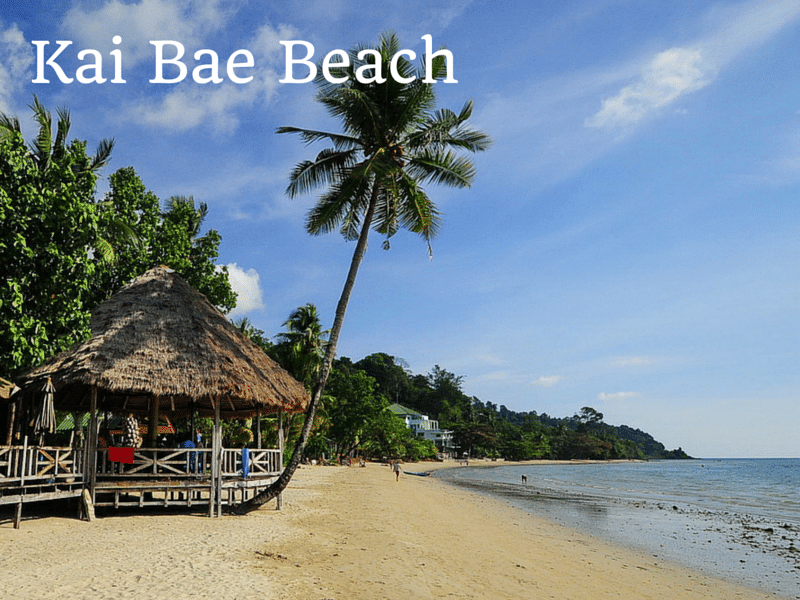 Kai Bae beach provides a mixture of nightlife, great restaurants and relaxing beach time. The beach, not as long or wide as Klong Prao or White Sand Beach, is known to be one of Koh Chang’s most tropical scenic settings. Overlooking the small islands across the bay, the beach is the place to head and rent out a kayak, to paddle over to one of those nearby islands, where you may end finding your own private beach. Towards the north end of the beach, you’ll find a pier, this is where boats depart to reach the islands south of Koh Chang. The village is located a few minutes walk back from the beach, stretching along the main street. The village is fairly busy and touristic, but not on the same level as White Sand Beach. Head to the southern end of the village and you are greeted with pretty cafes, gift shops, travel offices, scooter rental shops and restaurants and even a Tesco’s express. The northern end of Kai Bae is where the majority of the nightlife is located, based around a few roadside bars situated in the area. There are also a couple of restaurants to note, located on the beach, giving you some amazing views up and down the coastline. On the subject of food, Kai Bae is a great place to go on Koh Chang to sample the best international food the islands restaurants have to offer. Along with seafood restaurants, there are a couple Italian restaurants, and a few others offering English, Indian, and Russian dishes, plus more. A decent bakery, Papa Deli, can also be found in the village too. One word of warning in the narrow main road running through Kai Bae, with little in the way of pavements and a with it being the main drag, take care when walking/cycling as it can be hazardous at times. If you’re feeling adventurous head to the southern end of Kai Bae past the last 7-eleven, where you can follow a trail past fruit orchards, that then develops into a bit of a rugged trek eventually ending at a ‘secret’ waterfall. Don’t go looking for a map as it won’t show on there. It’s worth the effort of the walk and you’ll probably have it to yourself. Kai Bae is popular with independent travelers, families and older couples this is mainly down to the affordable accommodation and a somewhat peaceful setting, compared to say White Sand Beach. Known as Haad Tha Nam to the locals, Lonely Beach used to be cut off from the mainland, only reachable by a sweaty hike over a large hill. But it was, without doubt, worth the effort. A slice of paradise awaited, with little thatch huts for accommodation, it was truly a place to get away from it all that only the adventurous traveller found. Nowadays, the huts have been upgraded and there is a road connecting Lonely Beach to the rest of the west coast and beyond. Yet it does still retain some of its charm from years gone by, it is still the first port of call for many backpackers visiting Koh Chang and because there is less infrastructure here compared to the beaches further up the coast, you still get that feeling of a place separated from the rest of the island. The beach, although not the biggest is still every bit stunning. Towards the southern end, the beach fades away and gets replaced by pebbles, where a stream, coming off the mountains runs into the sea. Thankfully there is little development along the beach, bar a few resorts you’re away from it all. While Lonely Beach is still predominately focused towards backpackers, few boutique and higher end resorts are starting to appear. But the majority of accommodation is still aimed at the budget traveller, where you will find guesthouses, bungalows and mid-range resorts. As previously mentioned, there are only four places to stay along the beach, the rest are located in and around the village. To reach the village, you need to follow the road south of the beach and cross the bridge into the village. Along with accommodation, you will find bars and restaurants running along down the main road, and down a couple sois off the main drag. There are lots of little shops selling a whole range of things, a couple minimarts, tattoo parlours, dive shops, a gym and ATM’s. Lonely Beach village truly comes alive at night, there’s a very lively atmosphere, with a couple favourite places being Stone Free and Himmel and Ting Tong Bar, attracting travellers to drink and dance the night away. Apparently there is a cut off time of 02.00 am, but this is rarely enforced, with parties often carrying on long into the night. Along with the many bars, there are lots of great, cheap places to eat, plus affordable international cuisine at Tapas Bar and Q. If you want to escape Lonely Beach for the day, a short twenty minute walk along the road, up and over a hill, will bring you to Bailan Bay. Here you will experience a more relaxed atmosphere and escape the sometimes madness of Lonely Beach. The beach is tiny here and the swimming is pretty non-existent due to the hundreds of rocks lying on the seabed just metres from the shoreline. 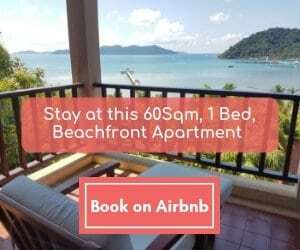 ( An exception is the man made beach at Mercure Hideaway ) Good value accommodation can also be found here, and you’ve got a choice from budget bungalows, mid-range resorts and one high end resort. Klong Kloi Beach. This is also known as Bangbao beach as it lies on the south of the island a kilometer from Bangbao fishing village. This area is getting busier every year and is a popular sport for day trippers. It’s a bit remote if you want to be able to get to other areas of the island easily. 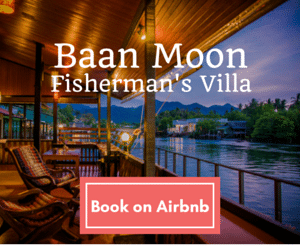 But there is a wide range of accommodation available from budget fan huts, such as Treehouse Cottage, to simple beach bungalows – Bangbao Beach Resort and Klong Kloi Cottage. Right up to luxury hotels such as Chivapuri Resort. Dan Kao Beach. 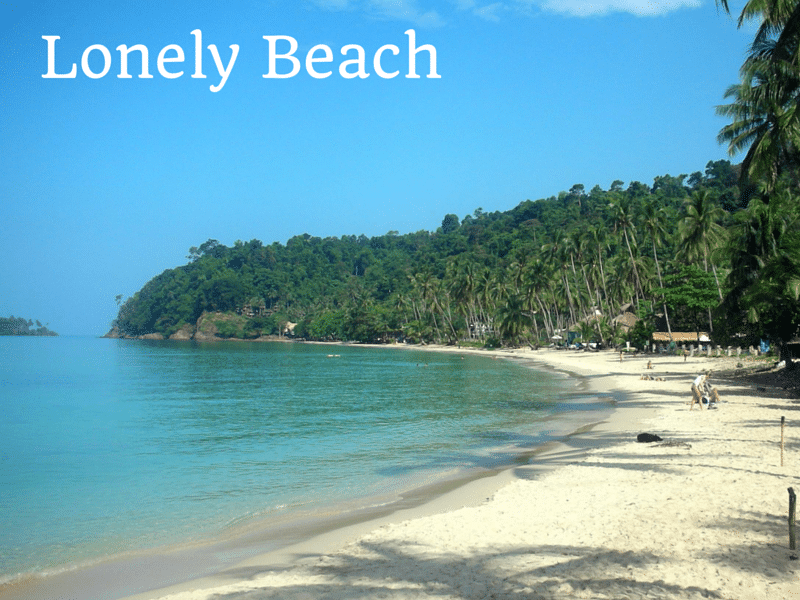 A small red sand beach that is home to three of Koh Chang’s best small resorts. Amber Sands, The Souk and Serenity Resort. This beach is on the east of the island, just a few minutes drive from the ferry piers. An ideal spot to get away from it all. Klong Son Beach. This 1.2Km long beach is home to the Siam Royal View housing development. However, anyone can go and use the beach. It’s very shallow so swimming is difficult at low tide. But it is also the location for regular beach cricket matches. Keep an eye on local Facebook pages for details. Long Beach. A hard to reach beach in the far south-east of the island. You’ll need your own transport to get there. The road to the beach is worth the journey in itself. It winds up onto the hillside and affords great views over Salakphet Bay. The final 2Km to Long Beach are unpaved, so care is needed. There’s one place to stay, Treehouse Bungalows, which opens for a few months each High Season and has extremely basic, but also cheap, huts. Wai Chaek Beach. Another hard to get to beach, located on the south coast of the island. it can be accessed by road from the main road a couple of kilometres from Salakphet village. Take the abandoned road and then turn off after a clearing where you’ll probably see a hand written sign and dirt track through a rubber plantation. Follow this , across a small river, and then through a coconut field to the deserted beach and lagoon.